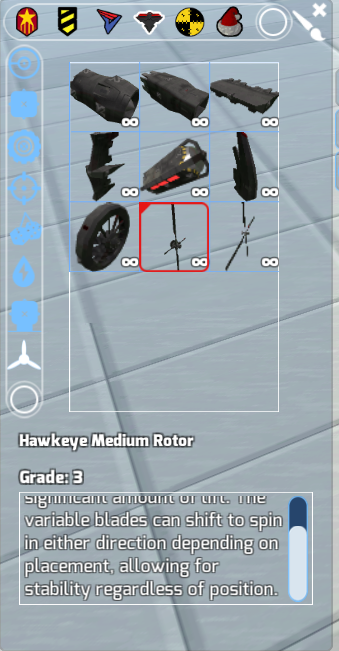 So when I first saw the hawkeye rotors I was quite excited for helicopters, seeing the description alluding to things like "variable blades" and "stability regardless of position" got me hyped. But as everyone knows, currently hawkeye rotors basically act as oversized propellers and nothing more, the rotor fan (albeit same with all other props) Can't even be used to steer when placed as a tail rotor, just thrusting nonstop. I'm hoping that the rotors get similiar effects to hover boosters if not acting like a reaction wheel gyroscope, leaning into the direction of keypresses instead of trying to keep it upright. My best attempt to emulate it is the Helix, shown below. Maybe have this feature toggleable? I have some planes and airships which use these propellers as forward thrust and I don't really want them leaning. How does one construct an aircraft big enough to justify such propulsion?